Some more lapsed copyright early Ditko. "Paper Romance" appeared in DARING LOVE #1 . 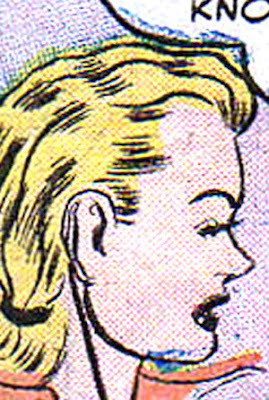 More specifically, the indicia lists September-October 1953, which makes it the earliest cover date for a comic book known to have Ditko artwork. As previously discussed, the relationship of cover dates with on-sale dates is fluid, both then and now, so I doubt it will ever be proven if this came out before BLACK MAGIC #27 [v4n3] [November-December 1953] or some other early Ditko, but for now that's what we have. And of course, who knows what order those early stories were drawn in. What little evidence there is supports the notion that this wasn't the first drawn, even if it was the first published. I think people like me spend too much time thinking about this kind of stuff. Let's actually read the comic book story, shall we? No wait, first let's talk about the publisher. It's listed as Gillmor Magazines (not "Gilmore" or "Gilmor" or "Gilmour", as it is sometimes cited). On the research I can do without leaving my comfortable chair, this is one of several names used by the publisher which can collectively be called either Stanmor or Key Publications. Owned by Stanley Morse, anyway, and effectively the same company which first had the Hamilton/Ditko "Stretching Things" and sold it to Farrell (and it looks like it shares some ownership with Timor, which we'll get to in a few weeks). This is the only issue of the series, the numbering (as fluid as cover dates and publisher names in that era) seems to continue with RADIANT LOVE, but there's no Ditko in there, so who cares? Okay, the comic! While I don't know much about Gillmor, I'm going to venture a guess that they paid their writers by the word (unlike this weblog). My god is this a verbose comic. Just too much. As you'll see, it's about a small town girl who is dissatisfied with her small town boyfriend, and engages (with the boyfriend's knowledge) in a pen-pal relationship with big city boy. Not awful, as such things go, but I really wish it had either twice the pages or half the words. The artwork obviously the big reason to care, and it's not quite as distinctively Ditko as some of his other early efforts (although I'm pretty sure it's Ditko solo, as a lot of the atypical elements also appear in lesser amounts in some other early work). A few panels stand out, especially those with some silhouette effect, like the last panel of page three and the last of the story. A lot of the clothing is actually more interesting than the faces. And interestingly, this is the cover story for the issue. Cover not by Ditko, but it is fairly well drawn, which can't be said about the other stories in this comic (and is the male face on the cover a swipe from some S&K comic? Could be). And of course, romance stories are unusual for Ditko. This appears to be the only one he did in the 1950s, and he only did a handful for Charlton in the 1968-1978 period (five I think, and even some of those were fantasy stories with a romance element in HAUNTED LOVE). Some of those weren't discovered as Ditko until just a few years ago, and this story wasn't discovered until the 1980s, leading Ditko fans to hope that a comprehensive search of obscure romance comics will yield the ever-elusive cry of "New Ditko Find". Scans adapted to my personal tastes from those found, and available for free download with registration, at the Golden Age Comics Download site. To buy Ditko comics and things on paper, go over here for ordering info on his exciting and essential creator-owned works and over here for info on recent and upcoming releases from all publishers. Click and ye shall embiggen. I must be a dyed-in-the-wool ditko buff, cuz these early finds really do the trick for me! My thanks for finding and annotating them!